Harvey just before landfall on the Texas Coast as a category four hurricane. Image courtesy NASA/NOAA GOES Project. Harvey, Irma, Maria, and Nate are the storm names that are being retired by the World Meteorological Organization after the destructive 2017 Atlantic Hurricane Season. 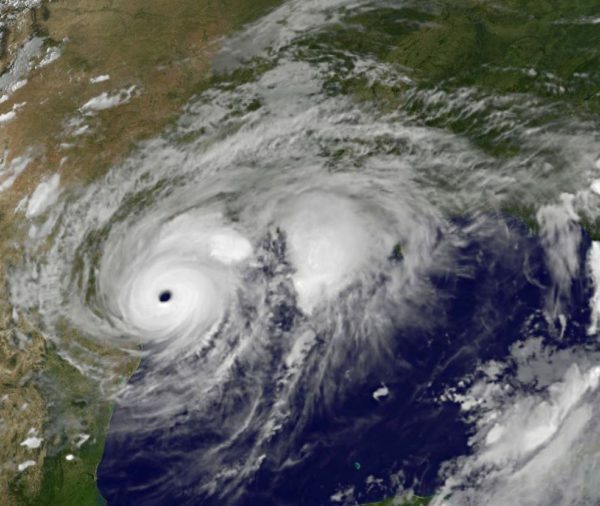 Storm names are retired if they were so deadly or destructive that the future use of the name would be insensitive – otherwise, names are reused on a six-year cycle. Hurricane Harvey made landfall on the Texas Coast just east of Corpus Christi on August 25th, causing serious storm surge and wind damage before stalling along the coast and bringing up to five feet of rain to parts of Southeast Texas. There were 68 direct fatalities in Texas, the most in that state from a tropical system since 1919. Harvey now ranks as the second costliest hurricane in U.S. history behind Katrina. Hurricane Irma made landfall as category five hurricane over the northern Caribbean Islands. Irma would go on to make landfall as a category four hurricane in the Florida Keys on September 10th. A total of 44 deaths were reported from the storm’s seven landfalls. Seven direct U.S. deaths were reported, along with 85 indirect deaths. Hurricane Maria ravaged the island of Dominica as a category 5 on September 19th and later devastated Puerto Rico as a high-end category 4 hurricane. It also inflicted serious damage on some of the other islands of the northeastern Caribbean Sea. Maria is the third costliest hurricane in U.S. history, behind Harvey and Katrina. Maria caused 31 direct deaths with 34 missing in Dominica, and two direct deaths in Guadeloupe. In Puerto Rico, the death toll stands at 65, which includes an unknown number of indirect deaths. Hurricane Nate crossed northeastern Nicaragua and eastern Honduras as a tropical storm, then made landfall on the northern Gulf Coast as a category 1 hurricane. It brought rainfall that caused significant impacts in Central America, where media reports indicate that these caused 44 deaths in the region. The total death toll from Nate was 45 with an additional nine people missing. Dr. Phil Kltzbach and the group at Colorado State have issued their extended range forecast for the 2018 Atlantic Hurricane Season. They are calling for slightly above normal activity this year as the basin transitions from a weak La Nina event into a weak El Nino event later in the season, which runs from June 1 until November 30th.